The Anthropic Principle is one of the most controversial conjectures of modern cosmology. And it's not just controversial among philosophers and scientists, but among Forteans as well... as evidenced by the less than warm reception given to the talk by Lynn Picknett and Clive Prince at last weekend's Fortean Times Unconvention. I've always been a big admirer of Lynn and Clive's historical researches, but I have to admit that when they strayed onto scientific subjects they rapidly got out of their depth (I'm sure I get equally out of my depth when I stray onto historical subjects... which I will do, further down this post!). 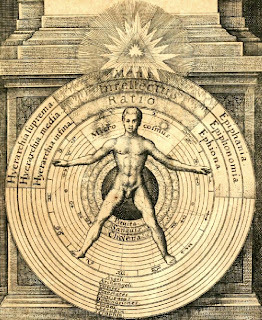 The attraction of the Anthropic Principle for Picknett and Prince is its supposed link to esoteric Hermeticism -- in particular, the idea that the Universe (macrocosm) mirrors the individual (microcosm), as depicted on the left (from Utriusque Cosmi by Robert Fludd, 1617). The very word Anthropic, with its suggestion of "anthropocentric" or "anthropomorphic", seems to support this. But really the Anthropic Principle has a lot more to do with the difference between a priori and a posteriori probabilities than with human beings per se. Current cosmological models involve a number of parameters that are observed to have certain values, but the theory doesn't explain why they have these values and not other ones. Yet if any of the parameters differed by just a small fraction from their actual value, human beings would never have existed to ask the question. 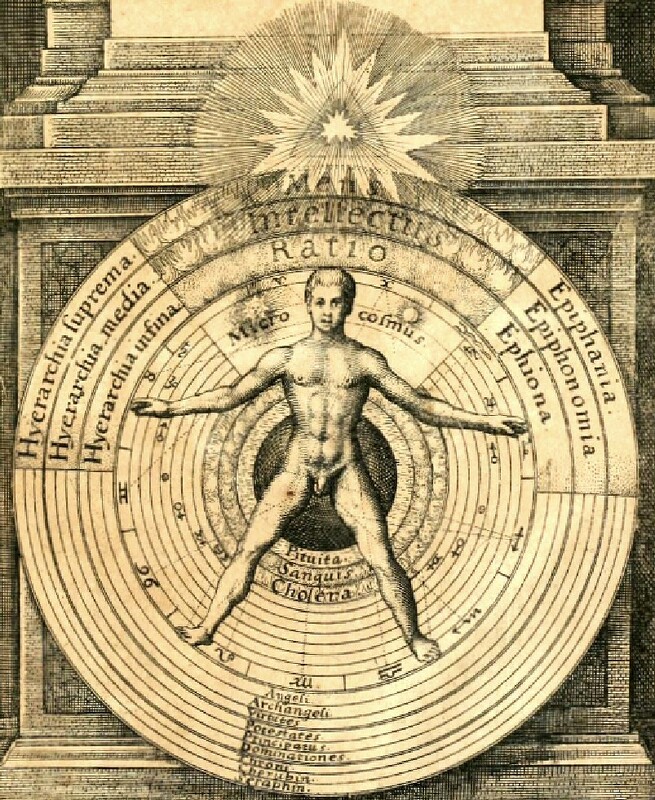 Therefore even if the a priori probability of the universe is very small, the fact that human beings exist makes it an absolute certainty in an a posteriori sense. As Sherlock Holmes famously said: "When you have eliminated the impossible, whatever remains, however improbable, must be the truth". It occurred to me that the Anthropic Principle extends to other "low probability" events besides the small matter of the creation of the Universe. Another example is the emergence of intelligent life on Earth. Many people (including hardened UFO skeptics) believe that intelligent life is an extremely rare phenomenon in the universe, and that the a priori probability of it emerging on any given planet is extremely low. And they may be right. All we know, from the fact that we exist, is that the probability is non-zero! As I alluded to earlier, you can even extend the Anthropic Principle to historical speculation. Throughout recorded history there have been branch points at which humanity might have been wiped out, or at the very least civilized society might have crumbled... but it didn't. And of course it didn't, or I wouldn't be talking to you now via the World Wide Web. But that doesn't mean that in 999 out of a thousand alternate time-lines human history didn't come to an abrupt end. A good example is the Third World War. Throughout the 1950s and 60s, there was a widespread belief in the inevitability of a nuclear confrontation between the Soviet Union and the West that would have resulted in the decimation of the world's population and the destruction of civilization as we know it. Countless science fiction novels and short stories of that period either portrayed such a war, or the devastated world that would be all that remained after it. Most of those stories were set in what is now the past -- and yet here we are, still blissfully unobliterated. Maybe there was a 99.99% chance of a world-ending nuclear conflict in the 1960s, but in retrospect 0.01% is as good as 100%. And maybe other low probability events can be explained the same way. What about the physics-defying trajectory of the bullet that killed JFK? Highly improbable, certainly -- but maybe he was the one who started World War Three in those 99.99% of alternative time-lines! The evidence for "fine tuning" and directionality of our universe for the overall life process is not limited to the physical parameters. It is to be found to a much greater extent in fields such as chemistry and biology. The model outlined very informally in "The Goldilocks Effect: What Has Serendipity Ever Done For Us?" provides a rather straight-forward minimalist interpretation. One which does not require the extravagances of multiverses, "intelligent design" or alternative time-lines. The book is a free download in e-book formats from the "Unusual Perspectives" website and you may well find it of interest. "Therefore even if the a priori probability of the universe is very small, the fact that human beings exist makes it an absolute certainty in an a posteriori sense." I am not getting the import of the pre-post event analysis of probability. As you know there are religious people out there that claim that the unlikelihood of the universe being just right (and of the emergence of human) intelligence is such that it suggests divine intervention. However, after having purchased the lottery ticket, won, and then calculating ones odds of having won, then a winner may think "gosh it is strange that I won bearing in mind the odds are so low." "Perhaps the fact that my uncle runs the lottery has something to do with it." or "Perhaps that the fact that I prayed to god / bought a lucky charm...had some effect." If before the lottery purchase stage, someone were to say "I think that I have outside help. I am going to purchase a lottery ticket and just you watch - I am sure I will win because my uncle/my prayer/my lucky charm" then they would be more persuasive. But the fact of something seemingly unlikely happening may make us suspicious that there were influences (uncles/gods/whatever) that in fact reduced those odds. E.g. when the World Trade Centre buildings fell down, most people thought that they simply fell down. Subsequently when people researched and found that buildings falling is very rare, some people felt that this suggested that the buildings were demolished. That does not make them right, or wrong, but there is nothing flawed about the thought process. Every time something very strange happens, i.e. something very unlikely happens, we look for other possible causes for the event that explain it as being not so unlikely. It is true that the fact of snow in summer is less persuasive of some plot than the fulfilled prediction of snow in summer. I am not sure why this is. I guess his is because during any summer there are unlikely events happening, so the snake oil salesman (or religious person) can pick on an event post hoc and claim that his snake oil or god caused it. But when it comes to the existence of humans is there this range of events that the religious can choose from? I do not propose a fine tuning God, but I do think that the low likelihood of human existence suggests something strange is going on, and that a posteriori nature of the calculation does not dispel this 'fishiness'. Thanks Timothy - you make some very good points. Whether the outcome of an event is "extraordinary" or not really depends on how many instances of that event there are. If there has only ever been one universe (this one), then you're right that it's still an extraordinary coincidence that it turned out so convenient for us, and this requires more than a glib "that's just the way it is" explanation. On the other hand, if there have been countless universes with different sets of parameters, it's virtually inevitable there will eventually be one that looks just like ours. I was implicitly assuming the latter situation, and I should have made this clear but didn't. Of course, we have no way of knowing whether there is just one universe or infinitely many. Belief in a multiverse is just as much a matter of faith as belief in an intelligent creator. Here's another, more mundane, coincidence. I wrote this post two and a half years ago, and I haven't written about Picknett and Prince and their Hermetic theories since that time. So your comment came out of the blue - but it was still a surprising coincidence to me. All this week I've been planning to return to this subject in my next post (probably Sunday 27 April), which is going to be about the book on which the lecture mentioned in this old post was based!